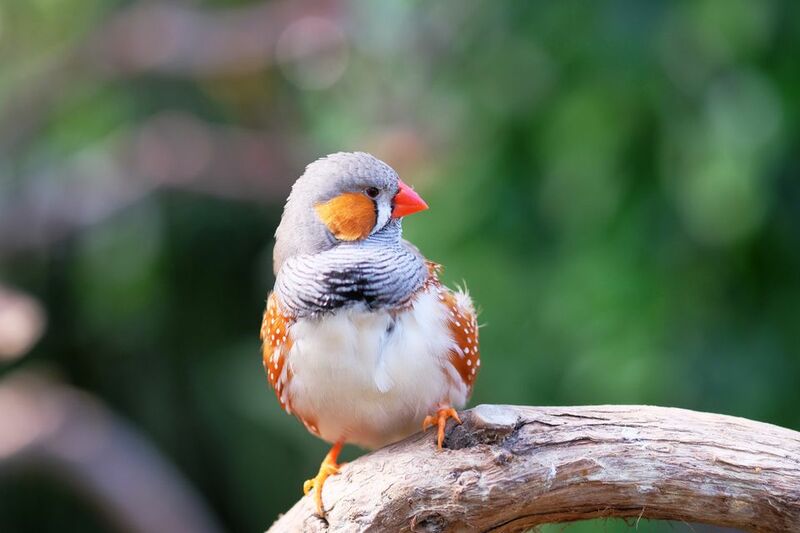 Zebra finches are a favorite of bird owners and have a fairly long life expectancy of five to nine years. They are known for their energetic singing, but if you want your finch to sing, be sure to get a male, since the females maintain their silence. The females lose out in the appearance department too, with gray the predominant color, whereas the male bird has dramatic coloring that includes a red beak, orange on its cheeks, stripes on the throat (hence the zebra moniker) over a black bar on the breast, with chestnut-colored flanks with white spots. An altogether handsome bird with a beautiful voice. Breeding zebra finches should be checked by a vet to ensure that they are in good overall health. They should also be at least one year old and should be free of physical defects. Zebra finches, especially breeders, need adequate room to fly and exercise. A good minimum cage size for a breeding pair is 24 inches by 24 feet by 24 inches. The bigger the cage, the better. You can provide your finches with a small woven nest made specifically for small birds or a traditional wooden nest box at least 8 by 8 by 8 inches. Remember to line the nest box with shredded paper or another safe nesting material. Breeding zebra finches usually do well with a staple diet of high-quality finch seed and pellet mix, supplemented with tiny slices of fruits, vegetables, eggs and other bird-safe fresh foods. Fresh sprouts are also highly nutritious and good for your breeding pair. Be sure to provide the pair with a good avian calcium supplement to support the hen during the egg-making process and help prevent egg binding. The average zebra finch can lay up to eight eggs in a single clutch, with the median being between three and six. The hen lays one egg each day until the clutch is complete and will begin incubating the eggs once the last one is laid. Zebra finch eggs begin to hatch within 12 to 15 days after the hen begins to sit on them. As a rule, if an egg hasn't hatched within 20 days, you can consider it infertile. Since zebra finches are not a type of bird that's handled under normal conditions, the parents should be allowed to raise the hatchlings undisturbed. Be sure to provide plenty of millet for the parents to feed the babies. The babies are usually weaned between the ages of 4 and 6 weeks.